Pottsville accommodation and Hastings Point accommodation, Pottsville Beach and Cabarita holiday accomodation and visitor guide. Tours, attractions and things to see and do on the Tweed Coast of NSW, New South Wales, Australia. Cabarita 2488, Hastings Point, Pottsville Beach, 2489. Tweed Vistor Information Centre - ph. (07) 5536 4244 or freecall 1800 674 414. The Tweed Coast and the seaside villages dotted along it are famous for beaches, surfing, fishing, reserves and beachside parks. Fingal Head, Kingscliff, Cabarita, Hastings Point, Pottsville Beach and Wooyung share the more than 25 kilometres of beaches and coastal reserves, from Tweed Heads to the north to Brunswick Heads in the south. 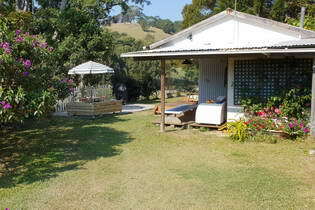 Located on the coast due east of Mt Warning, Pottsville offers a variety of accommodation, including budget caravan parks, cabins, holiday homes and flats, and a motel. Hastings Point and Cabarita Beach just to the north of Pottsville, provide a more diverse range of lodgings, ranging from holiday bungalows and flats, to motels, caravan parks, holiday apartments and holiday resorts. During the Xmas school holidays only, the public reserve at Hastings Point Headland is also open to visitors for camping, with bookings managed by the Tweed Coast Hastings Point Holiday Park. The Pottsville Shopping Village offers a range of services, and dining options including Italian, Indian, Thai, Chinese, seafood and fast food, while the local sports/bowls club provides excellent Aussie brasserie fare. For those who want to self cater there's a well stocked supermarket. Pottsville Beach Markets run by the Pottsville Beach Neighbourhood Centre operate on the first and third Sunday morning of the month, at the Phillip Street Reserve. During Summer, Autumn and Spring school holidays, Tweed Shire Council employs local lifeguards to patrol North and South Pottsville Beach at designated areas either side of the creek. Cudgera Creek at Hastings Point has long been a favourite for families, fisherfolk and adventure, providing ample opportunities for exploration, with canoeing, fishing and swimming popular, especially for children. Council has designated a dog exclusion area encompassing land east of Tweed Coast Road from Yugari Drive north to Peninsula Street, including all foreshore areas of the Cudgera Creek estuary and the beach north of Cudgera Creek mouth to the shoreline adjacent to the Peninsula Street beach access walkway. The closure of this area to dogs is to protect significant shorebird and beach nesting bird habitat and reduce disturbance. You can find more information about Gold Coast, Tweed and Byron Shire Councils off leash and pet exercise areas here. The Tweed Bicentennial Environmental Park at Pottsville, is a delightful natural setting for family picnics, walking and bicycling. 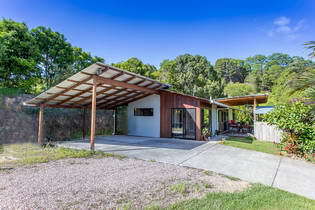 An off-road bicycling and walking path connects the villages from Pottsville Beach to Kingscliff, with the ample picnic areas along the coast providing free electric B.B.Q.s and amenities. At Norries Headland (Cabarita) and Hastings Point Headland, timbered walking tracks wind from the beach to the headland. Boat launch ramps are available at Pottsville and Hastings Point. On the Coast Road at Pottsville Beach between two arms of Cudgera Creek, the Tweed Bicentennial Environmental Park contains fresh and saltwater (mangrove) wetland, coastal eucalypt forest and remnants of heath and rainforest. Recreation facilities include walking trails (also suitable for bicycling), a large grassed area, free electric barbecues, drinking water, picnic tables and amenities block. Walking tracks are well developed, with boardwalks through wetland areas and viewing platforms by the creek. There is also an Environmental Education Centre which is available for hire to approved community, school and environmental groups. Groups have access to an extensive camping area, toilets, hot showers, and full kitchen facilities. Ph. Tweed Shire Council on (02) 6670 2400. The original name for this seaside locality is Bogangar, believed to be an Aboriginal word meaning "place of many pippies". There's a shopping centre with Woowooths Supermarket and speciality retailers if you don't fancy the short drive to Kingscliff or Tweed Heads. Cabarita still offers a lowkey beachfront camping ground, while the former modest "hideaway" lodge has now been renovated as a luxury full service accommodation hotel. Along with an assortment of holiday apartments and a luxury beachfront resort, "Caba" still retains a laid back and relaxed holiday atmosphere, where the main activities are surfing (with a long right hand point break), swimming, beach and estuary fishing and canoeing. 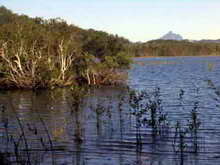 Encompassing Cudgen Lake and Round Mountain, and straddling Clothiers Creek Road, Cudgen Nature Reserve is located less than a kilometre west of Cabarita. Ideal for canoeing, access to Cudgen Lake and the foreshores, which has picnic facilities, is available via an easement adjacent to Cabarita Lake Apartments. An Aboriginal stone quarry has been found on the edge of the lake and the area remains of significance to local Kooris. There are excellent views of Mt Warning from its eastern shore on a clear day. The reserve contains a variety of vegetation types which are home to a number of threatened plant and animal species, and also supports a dwindling coastal koala population. Mt Warning and Nightcap National Parks are about 40 km away. Getting here is easy: Located just a few minutes from the Pacific Highway, Pottsville is about 11 hours drive north from Sydney and about 70 minutes drive south from Brisbane, via the Pacific Motorway. Domestic flights operate from all capital cities to Gold Coast Airport at Coolangatta, 20 minutes to the north and the Ballina/Byron Gateway airport 45 minutes south. A number of international carriers servicing SE Asia, New Zealand and the Pacific fly into Gold Coast Airport. Airport transfer services are available from both airports. Some shuttles also go to Brisbane International Airport. Visit Gold Coast Airport Transfer Services for more information. Local bus services travel from Pottsville and Hastings Point in the south, to the Gold Coast and theme parks in the north. Daily interstate coach services are available are available from Brisbane and Sydney, and daily or overnight train from Sydney to Brisbane via coach transfer at Casino. Visit Tweed Coast - Transport Services Information for more transport information, including trains, coach and local bus schedules, taxis, airport, and transfer services covering Cabarita, Casuarina, Chinderah, Hastings Point, Kingscliff and Pottsville. Northern Rivers Carpool provides locals and visitors with the opportunity to share transport in the region.